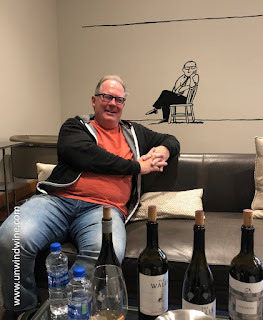 One of the highlights of our Walla Walla Wine Experience 2018 was a visit to The Walls Winery, and meeting former tech exec, Founder and CEO, Mike Martin. 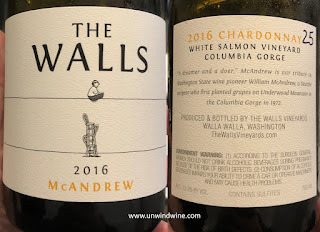 The "Walls”, is an imaginative tribute to the Walla Walla regional name and the historic legacy of the Washington State Penitentiary there, also known as 'Concrete Mama', which looms on the outskirts of town, just down the road from some of vineyard sources for their wines. "Like you, our wines are different." Legend has it that in the 1880's, the young town of Walla Walla chose to site a prison, rather than a University, within its city limits. While to some this may have seemed an odd decision, to the locals of the time it was more about pride. The Walls pays tribute to the notorious landmark that has been a cornerstone of the community dating back to 1886. Life behind the “Walls” was memorialized in the book “Concrete Mama”, nickname for the prison, published back in 1981, a compendium of photographs and stories showing the uniqueness of the place including the preponderance of motorcycles behind the gates. The classic book is being republished in an upcoming re-release. 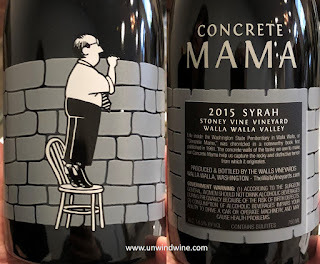 The Walls memorialize the book and stories with a flagship wine, 'Concrete Mama', a big firm Syrah in a large oversized heavy bottle with etched label of an image of Wall's character Stanley Groovey peering over the wall. The Walls is also a testament as a metaphor for life and the role wine plays in our existence. The owner cites: "You can’t drive into Walla Walla -- to drink wine, play golf, spend time with friends and family -- and not think about life behind those walls. This contradiction is also a personal one as walls have become metaphors in all of our lives -- we put up walls to protect our hearts, we toil within the walls of work constraints, we build walls to defend what’s important to us. "Nevertheless, as we build walls we’re also always looking for ways we can tear them down. Wine is the river that can overflow, subvert and topple these walls. It is a powerful force in bringing people together and building true community, capturing and preserving memories of time, places and people." Mike Martin has fun with The Walls branding and marketing. He has created a whimsical cartoonish character Stanley Groovey who adorns the building front, the tasting room, and many of the labels. We laughed at the imagery of a 'Where's Waldo' theme where the character pops up in the vineyards or him appearing dressed in red on Christmas promotions of holiday labels. 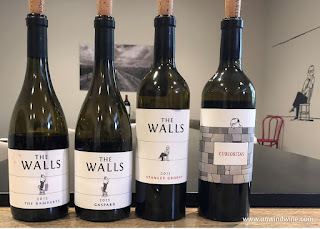 The Walls portfolio includes a broad selection of red and white wines with creative and curious names including: Curiositas, The Ramparts, Gaspard, and Stanley Groovy (from Red Mountain); Concrete Mama, and Wonderful Nightmare from the Rocks District of Milton Freewater, and Cheys, Lip Stinger, Martin’s Gold, Cruel Summer from Yakima Valley AVA, and La Lutte and McAndrew from Columbia Gorg. The Walls source grape from the usual suspects of prime appellations' sites with distinctive terroir in the state. 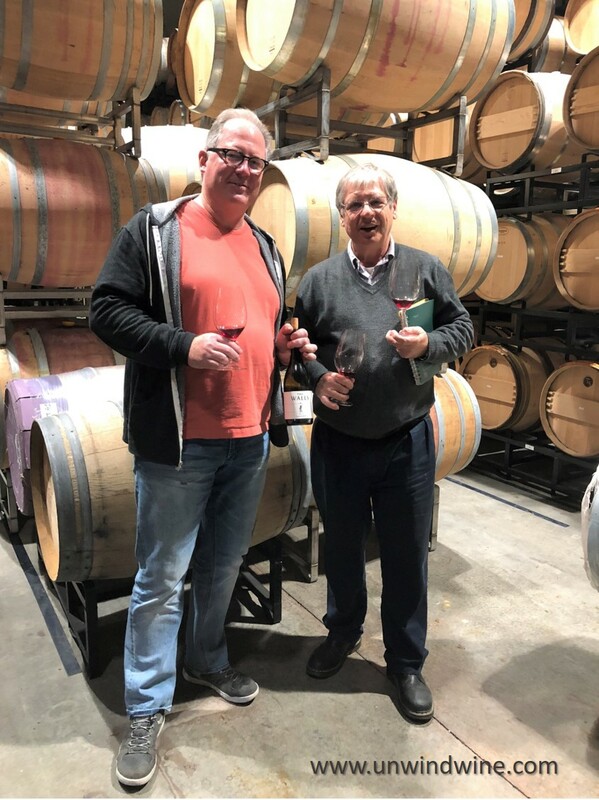 They are developing their own 18-acre Estate vineyard in perhaps the most distinctive place or terroir, the Rocks District of Milton Freewater, the country’s newest AVA. Wine Spectator calls this AVA “perhaps America’s most distinctive example of terroir." The unique riverbed of cobblestones and pebbles is as much as two hundred feet deep, formed 12,000 years ago from massive floods that swept through the region caused by ruptures in the ice dam that held Montana's glacial Lake Missoula. The Rocks District is a 12-square mile alluvial fan of 3,770 acres. 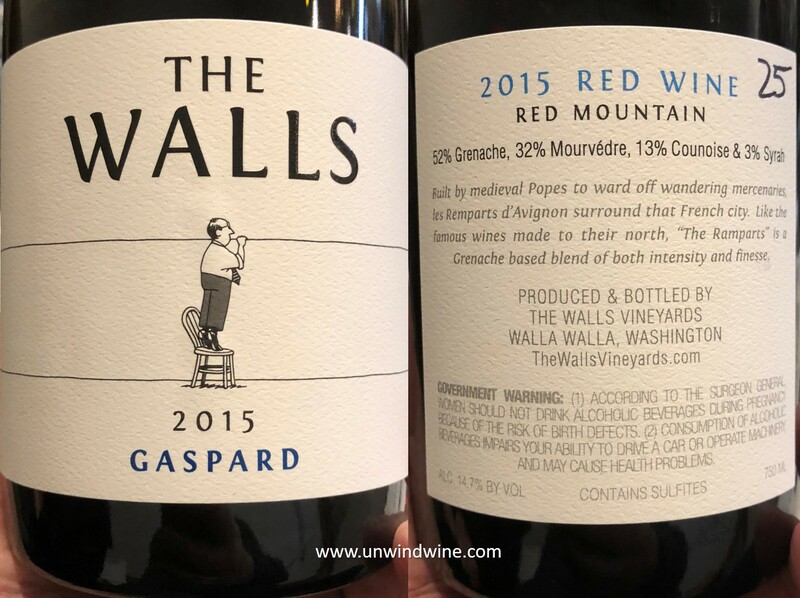 The Walls also sources grapes from Red Mountain, Yakima Valley and the Columbia River Gorge AVA's. Yakima Valley was Washington’s first official federally-recognized AVA located along the banks of the Yakima River. The Yakima Valley AVA also has sub appellations of Red Mountain, Rattlesnake Hills and Snipes Mountain. There are more than 150 wineries with more than 17,000 vineyard acres planted. The Yakima Valley AVA is the largest sub-appellation of the Columbia Valley AVA both in total size and wine-grape acreage. The Red Mountain AVA is Washington's smallest is typically the warmest growing region in Washington, with daytime averages of 90 degrees and lows dropping below 50. These fluctuations in temperatures promote sugar accumulation with the day’s heat while cool nights promote balanced acidity. Red varietals are dominate in the AVA’s where the sweltering slopes are well-known for Rhone varietals on the upper slopes and Bordeaux varietals on the lower blocks near the valley floor. The Columbia River Gorge AVA straddles the Columbia River for a stretch of about 15 miles, including 280 square miles in the Cascade foothills above the Columbia River Gorge, near Hood River, Oregon. The Columbia River Gorge is a unique geological site where the mighty Columbia River flows approximately 80 miles from one side of the Cascade Mountain Range to the other. It is the only such passage through any major mountain range in the Western Hemisphere. The climate and terrain of the wine producing appellation are similar to the French wine regions of Burgundy and the northern Rhone Valley. The cool western end of the Gorge produces Pinot Noir and Chardonnay; further east provides Pinot Gris and warmer-weather red grapes such as Syrah, Zinfandel, Cabernets and Barberas as well as white Rieslings, Gewürztraminers and Viogniers. 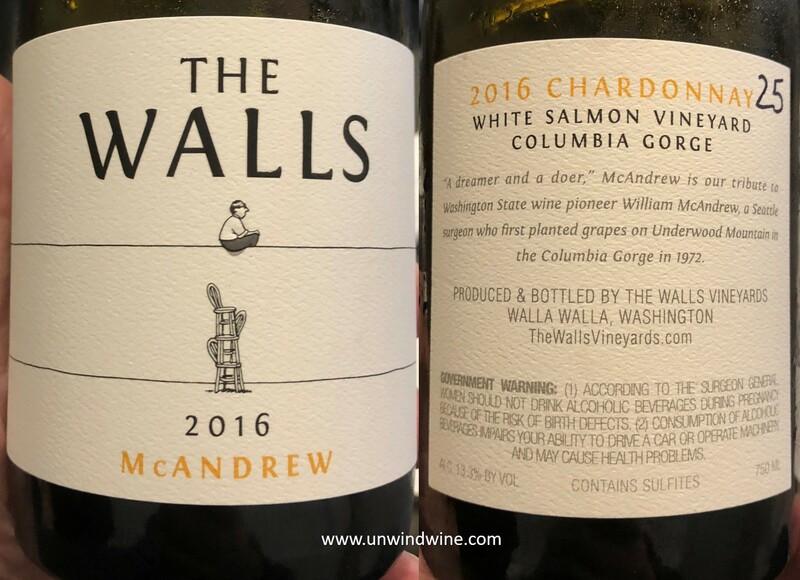 This wine is a tribute to 'Doc' William McAndrew, Seattle Surgeon who first planted grapes on Underwood Mountain in the Columbia Gorge in 1972. This is 100% Chardonnay, sourced from cuttings from Doc’s original plants and is made in a crisp, fresh style using the finest concrete tanks imported from Burgundy. Walls offer it both in his memory and with his “if you can dream it, do it” spirit. The Walls The Ramparts Red Rhone Blend 2015 - A Southern Rhone Chateauneuf-du-Pape style blend of Grenache (52%), Mouvedre (32%), Counnoise (13%), and Syrah (3%). This is a tribute to the walled city of Avignon, just south of the Chateaunuef-du-Pape appellation, Les Ramparts d'Avignon were built by Medievel Popes to ward off mercenaries. This wine began as an experiment with this vintage. Walls took what is sometimes called a GSM blend but blended in an otherwise higher percentage of Mourvedre and added another Southern Rhone CDP varietal Counoise resulting in further layers of complexity. 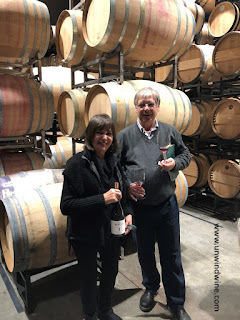 They confined it - protecting it - within the cool walls of a concrete tank for three months, producing a favorite wine with dark fruit and wet stone balanced by a light body with bright hints of fresh plum and lilac. 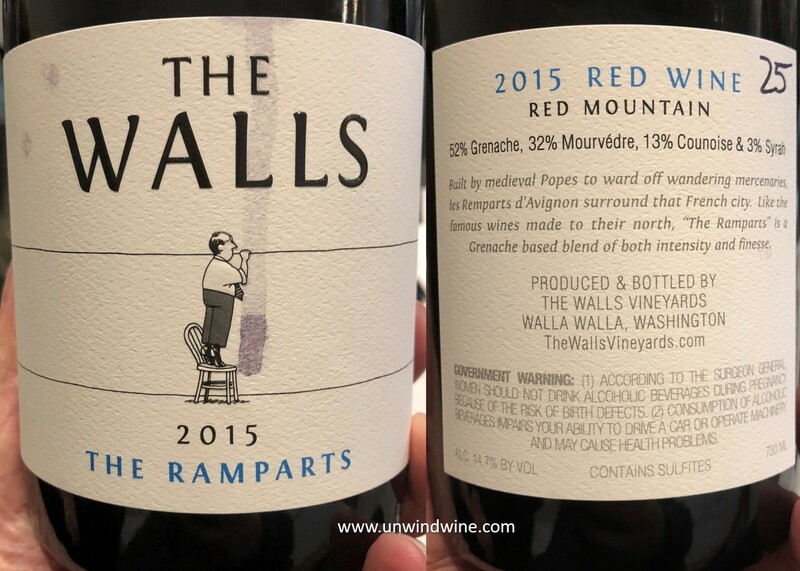 The 2015 Ramparts earned a gold medal in the 2018 Great Northwest Invitational Wine Competition. 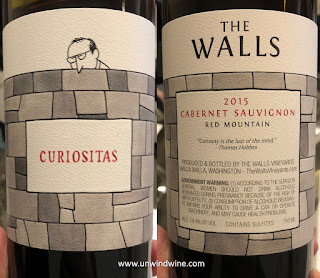 The Walls Curiositas Red Mountain Cabernet Sauvignon 2015 - This was my absolute favorite of the flight. Of course I tend to favor Bordeaux varietals but I found this especially appealing. The fruit for this was sourced from the Obelisco Vineyard on the higher slopes of the Red Mountain AVA. The vines get increased exposure to the sun and are planted in higher density to further stress the grapes. The result is a wine of great complexity but one that is elegant and lush, yet subtle with tones the winemaker describes as possessing 'freshness that evokes a Margaux-styled fragrant' Cabernet' I grabbed a case of this and am eager to try it home and share with my wine buddies and friends with grilled steak. 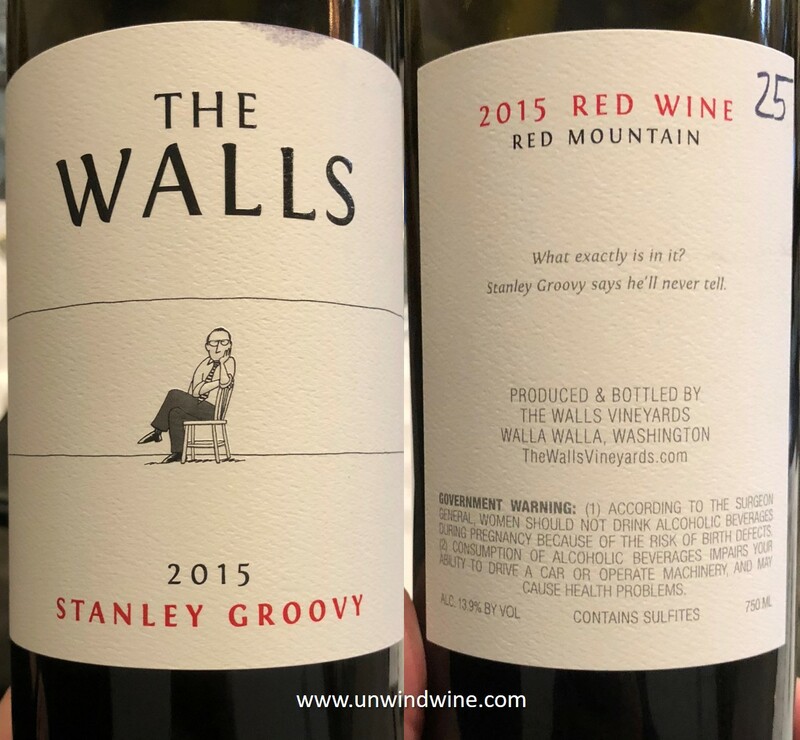 The Walls Stanley Groovey Red Mountain Red Wine 2015 - This is a complex unique blend of 55% Touriga Nacional, 21% Cabernet Sauvignon, 13.5% Souzao, 9% Tinta Cao, 1.5% Tempranillo. 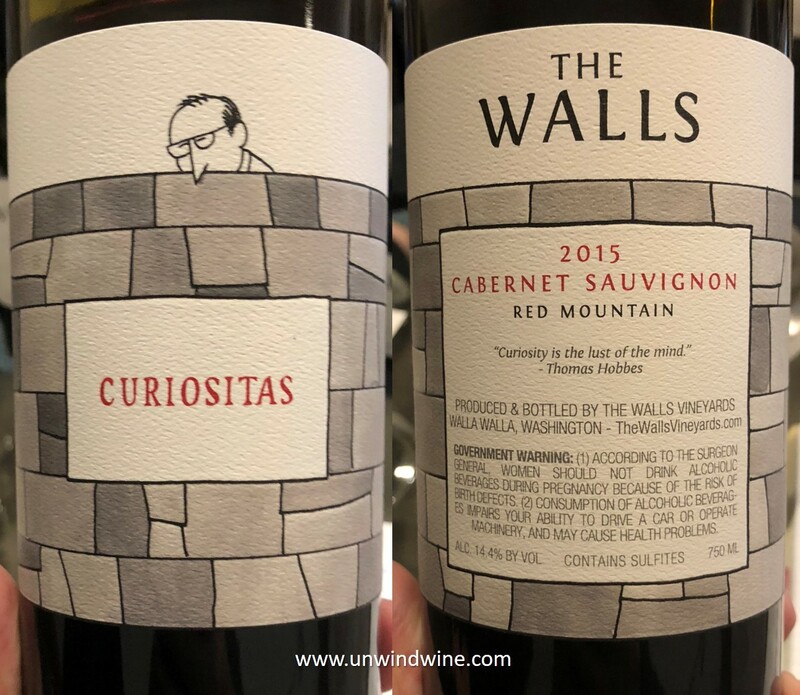 While I would not call this the 'signature' wine of The Walls, it is their namesake wine, named for their signature branded character. The complexity and uniqueness of the wine is indicated by the diverse varied blend of varietal grapes from Portugal accenting Cabernet Sauvignon, the principle grape of Bordeaux. 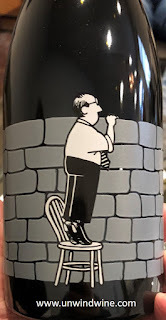 The Walls 'Concrete Mama' Walla Walla Valley Syrah 2015 - This is a blend of 91% Syrah from the Stoney Vine Vineyard and 9% Grenache from the River Rock Vineyard from the Walla Walla AVA. 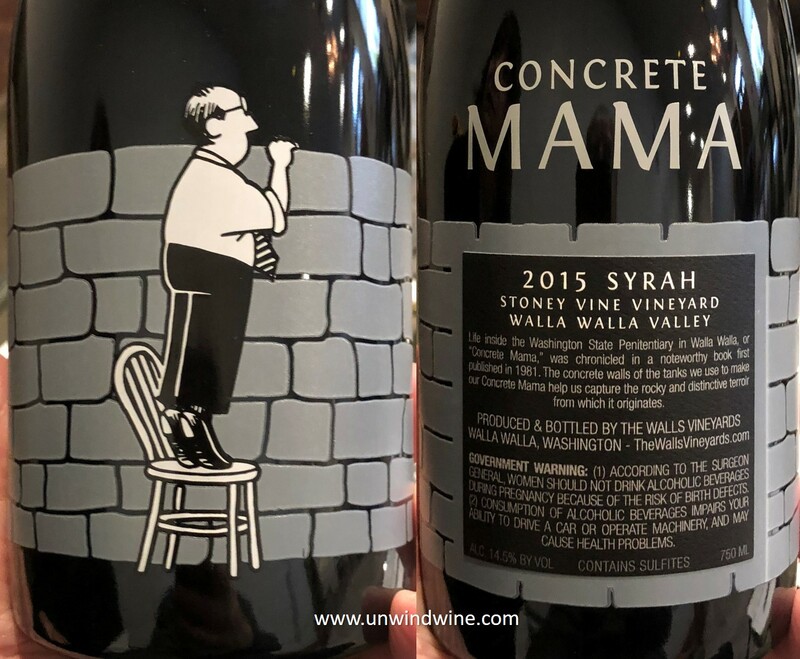 This is the second vintage of this label, named for the State Penitentiary near the winery on the outskirts of town, bearing the same nickname as this wine, 'Concrete Mama'. 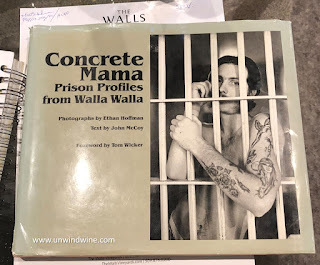 "In the 1880's Walla Walla chose to site a prison, rather than a University, within its city limits. 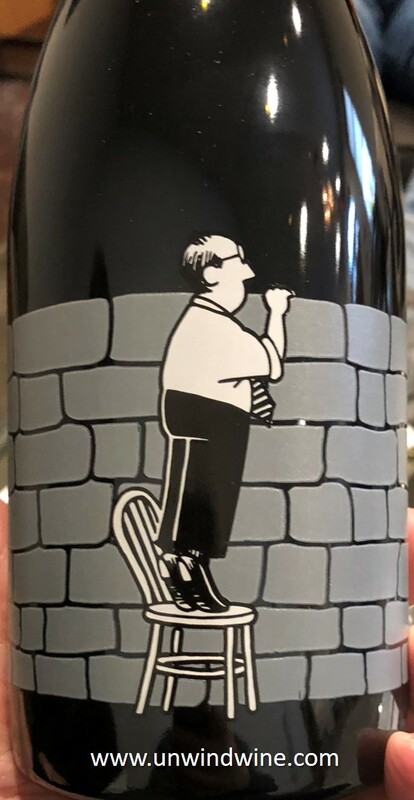 This is dark inky purple plum and ruby colored, big, bold and concentrated dense rich ripe black currant and black raspberry fruits accented by layers of olive tapenade, tobacco and pepper.